Under Andy Grove's leadership, Intel has become the world's largest chipmaker, the fifth-most-admired company in America, and the seventh-most-profitable company among the Fortune 500. You don't achieve rankings like these unless you have mastered a rare understanding of the art of business and an unusual way with its practice. Few CEOs can claim this level of consistent record-breaking success. 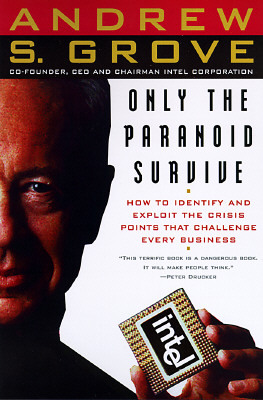 Grove attributes much of this success to the philosophy and strategy he reveals in "Only the Paranoid Survive--"a book that is unique in leadership annals for offering a bold new business measure, and for taking the reader deep inside the workings of a major corporation. Grove's contribution to business thinking concerns a new way of measuring the nightmare moment every leader dreads--the moment when massive change occurs and all bets are off. The success you had the day before is gone, destroyed by unforeseen changes that hit like a stage-six rapid. Grove calls such moments Strategic Inflection Points, and he has lived through several. When SlPs hit, all rules of business shift fast, furiously, and forever. SlPs can be set off by almost anything--megacompetition, an arcane change in regulations, or a seemingly modest change in technology. Yet in the watchful leader's hand, SlPs can be an ace. Managed right, a company can turn a SIP into a positive force to win in the marketplace and emerge stronger than ever. To achieve that level of mastery over change, you must know its properties inside and out. Grove addresses questions such as these: What are the stages of these tidal waves? What sources do you turn to in order to foresee dangers before trouble announces itself? When threatsabound, how do you deal with your emotions, your calendar, your career--as well as with your most loyal managers and customers, who may cling to tradition? No stranger to risk, Grove examines his own record of success and failure, including the drama of how he navigated the events of the Pentium flaw, which threatened Intel in a major way, and how he is dealing with the SIP brought on by the Internet. The work of a lifetime of reflection, "Only the Paranoid Survive "is a contemporary classic of leadership skills.